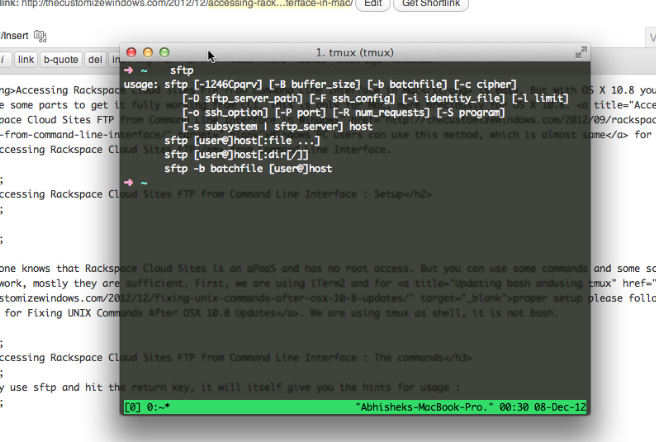 Accessing Rackspace Cloud Sites FTP from Command Line Interface in Mac is easy. But with OS X 10.8 you have update some parts to get it fully working from CLI. This is only for Mac, more preciously for OS X 10.8. Windows PC users can use this method, which is almost same for Accessing Rackspace Cloud Sites FTP from Command Line Interface. Everyone knows that Rackspace Cloud Sites is an aPaaS and has no root access. But you can use some commands and some scripts for your work, mostly they are sufficient, and that makes this accessing Rackspace Cloud Sites FTP from Command Line Interface in Mac guide unique. First, we are using iTerm2 and for proper setup please follow this guide for Fixing UNIX Commands After OSX 10.8 Updates. We are using tmux as shell, it is not bash. This Article Has Been Shared 9587 Times! Private cloud Computing technology gives the full control and high scalability in a private, dedicated environment mainly as an Enterprise solution. Cloud Storage is a business asset of no small importance, it is capable of solving problems of data storage. Flexibility and business continuity are the characteristics. Cite this article as: Abhishek Ghosh, "Accessing Rackspace Cloud Sites FTP from Command Line Interface in Mac," in The Customize Windows, December 7, 2012, April 25, 2019, https://thecustomizewindows.com/2012/12/accessing-rackspace-cloud-sites-ftp-from-command-line-interface-in-mac/.